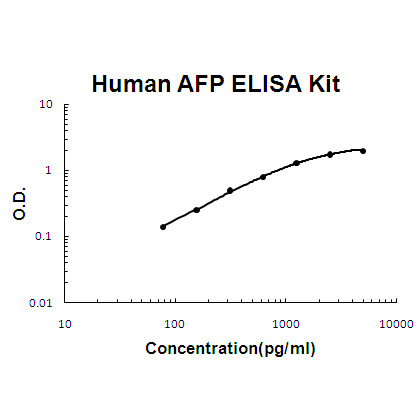 Intended UseHuman AFP ELISA Kit allows for the in vitro quantitative determination of AFP , concentrations in serum, Plasma , tissue homogenates and Cell culture supernates and Other biological fluids. specificalPrinciple of the assay: Human AFP ELISA Kit was based on standard sandwich enzyme-linked immune-sorbent assay technology. A monoclonal antibody from mouse specific for AFP has been precoated onto 96-well plates. Standards (Expression system for standard: NSO, Immunogen sequence: R19-V609) and test samples are added to the wells, a biotinylated detection polyclonal antibody from goat specific for AFP is added subsequently and then followed by washing with PBS or TBS buffer. Avidin-Biotin-Peroxidase Complex was added and unbound conjugates were washed away with PBS or TBS buffer. HRP substrate TMB was used to visualize HRP enzymatic reaction. TMB was catalyzed by HRP to produce a blue color product that changed into yellow after adding acidic stop solution. The density of yellow is proportional to the human AFP amount of sample captured in plate. Background: Alpha-fetoprotein (AFP, alpha-fetoprotein; also sometimes called alpha-1-fetoprotein, alpha-fetoglobulin, or alpha fetal protein) is a protein that in humans is encoded by the AFP gene. The AFP gene is located on the q arm of chromosome 4 (4q25). AFP is the most abundant plasma protein found in the human fetus. Plasma levels decrease rapidly after birth but begin decreasing prenatally starting at the end of the first trimester. Normal adult levels are usually achieved by the age of 8 to 12 months. The function of AFP in adult humans is unknown; however, in rodents it binds estradiol to prevent the transport of this hormone across the placenta to the fetus. The main function of this is to prevent the virilization of female fetuses. As human AFP does not bind estrogen, its function in humans is less clear. Inquiry About Human AFP ELISA Kit If you hope to order it or contact us directly, please contact us via sales@biobool.com. We will get back to you in 12hrs,Thanks!